Very nicely decorated, clean and well maintained property. Just as described in the listing. Great view of ocean and sunset too! We've stayed at over 25 different places and locations around the island over the past 35 years and this is one of our favourite accommodations and resort. The owner is very friendly and the daily maid , Beverly was awesome. A short walk along the beach to our favourite restaurant, Lonestar, is a plus and the distance from Holetown is only a 20 minute walk. Just returned from a perfect holiday! We have just returned from our second stay in in Ocean Blue, and the fact that immediately after staying there for a week in 2018 we contacted Penny to book a three week stay this year should be a good indication of what we think of this unit. Glitter Bay is a great property with well maintained grounds and facilities, and fantastic staff. Some may think that the fact that beach chairs are assigned to a guest for their entire stay is a bit odd and fussy, we think it is quite civilized. The location is very good. Close enough to walk into Holetown or up the beach to some very good restaurants. Penny’s unit is beautifully updated with comfortable furnishings and has a very well equipped kitchen. The housekeeper keeps everything sparkling clean, and wil even do personal laundry. We would not hesitate to recommend this unit, and hope to be back ourselves in the near future. I am so glad you enjoyed another great vacation at apartment Ocean Blue and I am please you would book to stay with us again. I also think the beach/sunlounger policy is good as there is never any awkwardness about who sat where yesterday, and if you don't like where you are sitting the beach staff will move you as soon as they can. Beverley the housekeeper says you are very considerate guests. Thank you for taking the time to do a review. 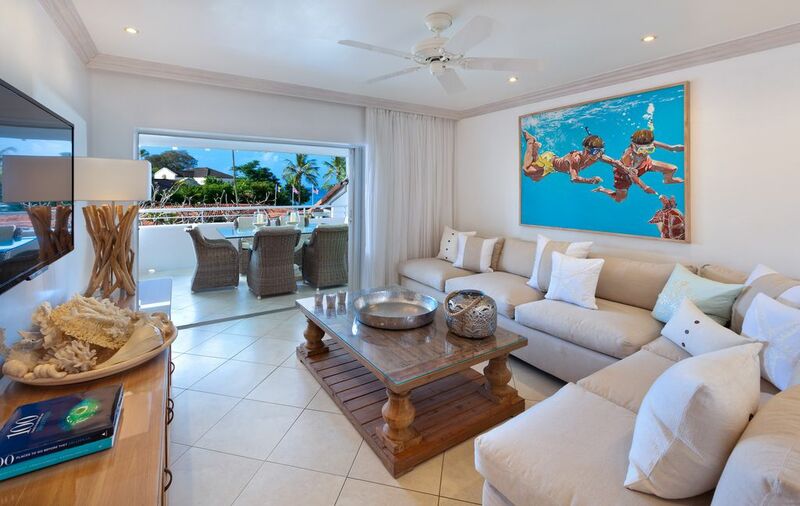 An exceptional beachfront two bedroomed apartment. Ocean Blue is a stunning apartment, no expense has been spared on the fixtures and fittings, put together by the owner with enviable creative flair. The sofas and beds are luxuriously comfortable, perfect for rest and relaxation. Daily visits from the housekeeper maintain the apartment to an immaculate level. A double balcony overlooks the colourful gardens, with views of the ocean, perfect. The Glitter Bay restaurant and bar offers delicious lunches, happy hours and a weekly barbecue. We particularly appreciated the attention of the beach attendant who allocated our comfortable sunloungers for the duration of our stay. Glitter Bay is in an excellent location, we regard the beach as the best on the West coast, with excellent bathing and water sports available. Some popular restaurants and bars are within walking distance, taxis are readily available for those further away. I would recommend Ocean Blue at Glitter Bay to friends and relatives, it’s the perfect destination for a peaceful, relaxing, stress free holiday. An incredible apartment with sea views. This is a beautiful space, incredibly well maintained; clean and with every kitchen amenity/gadget you could possibly think of using. The owner is very welcoming and helpful. We have been to Glitter Bay four times and fall a little more in love every year. I could not recommend this property highly enough. Stunning apartment. Great location within private development with own beach area - pools and gardens. The apartment its self is wonderfully decorated and laid out. All very comfortable with everything you need for relaxing holiday. We had been advised by friends that Glitter Bay was a great place to stay in Barbados and, having stayed in Ocean Blue for week, we can honestly say it exceeded our expectations in every way. The apartment is luxurious, spacious and extremely comfortable and relaxing. Ocean Blue is furnished to a very high standard and is equipped with everything you could possibly need, and the balcony offers a superb setting for both dining or just relaxing and looking at the sea with a glass of wine in hand! The information and images for Ocean Blue give a true and accurate picture of the apartment and the resort facilities, and Penny was very helpful in arranging the booking and transfer from the airport. The apartment was cleaned thoroughly on a daily basis and it was great to have a little extra help with some laundry! The concierge service on the beach was also an added bonus - no worries about towels and sunbed....just choose where you want to lie and it's yours for the duration of your visit - and the small bar offered good cocktails and lunch options at reasonable prices. Thank you for your five star review. We are always pleased to hear that our guests had a fantastic time in Barbados, and that you were extremely happy with the apartment. Glitter Bay is such a relaxed and attractive destination and a perfect location for family holidays. We originally brought our own daughter here when she was three years old and we fell in love with the place then, now she is a mum with small children herself. We purchased the apartment thirteen years ago and are delighted that families enjoy the place as much as we do. It was very kind of you to take the time to let us know that your holiday was a success and I am very glad you have taken home such happy memories. Thank you again, it was a pleasure to deal with you.